An intimate 6 Month Program for women who are being called more deeply on their path of purpose and leadership and are seeking a space to be empowered in their growth, both internally and externally. You are a woman who is called to service. You feel you are being initiated into your own power and voice and are looking for a space and container that will empower you in that. You are a visionary, an empath, an introvert, a creator, an intuitive, a facilitator or mentor, yourself. You feel yourself getting pulled off track by insecurities and fears, doubts and worries that seem to keep you away from the focus of what you are moved to step into. You are overwhelmed with the spaces of how...How do I build a practice? How do I get clients? How do I grow my vision? How do I step into my leadership? How do I move through and hold space for everything that is moving around me in my life? Many times, we look to our external world to get the outcomes and results we want. We think if we figure out how to be visible, how to show up more deeply, how to speak to what we do, we will create the pathways we are wanting to in our work and in what we are trying to call into our lives, both personally and professionally. When truly what is happening is we are being asked to get grounded, clear and solid within ourselves, so that we have the pathway within to step into our communication, our clarity, purpose and our leadership. Is about empowering you in your growth internally so you can create the outcomes you want externally. It is about holding space for the empowerment of the shifts you need to take within---in your mindset, your boundaries, how you hold space for yourself, how to cultivate the courage and the confidence to step into where you are wanting to go with your purpose and medicine. It is about having someone that will be that gentle guiding light back to your alignment and center so you don’t get so blown off course by what is happening in life. This space will hold you in that. Sacred women, it is time to dance with your power, remember who you be in the world and step into leading your purpose and movement of sacred work with more authority and authenticity in where you are being called. We are entering into a time and space in our energy where we are being asked to gather, prepare and go inwards to cultivate the space that is necessary to plant the seeds with which we grow internally and externally looking into the year ahead. This is a perfect space to drop into being held in what you are needing to release, what is wanting to be birthed within you and what it looks like to be in the embodiment of it out in the world. From being our authentic selves in the world? From owning our vision and our leadership? From creating sacred boundaries around ourselves and others? From taking ownership of our gifts and sharing them purposefully with the world? Our internal dialogue, the landscape that we move through within ourselves is often the thing that carries us away from purpose, dilutes our leadership and has us turning away from what calls us deeply to step into. This container is about holding you accountable to your leadership, your authenticity, and your fullest potential as a creator and purpose holder. From a meta view perspective what is the bigger purpose of our being and of our work. What is at the core of what we are called to hold space for in others. What is the resonance and alignment of purpose that we can anchor into. When we know our purpose and our greater why it gives us great courage to be take the action and have the courage to see our visions through. You will be called forward in what challenges you. You will be given tools to move away from negative patterns that are continuing to operate within yourself and your life. And you will be given guidance that is intuitive driven, that seeks to aid you on the path of manifestation of your greatest visions and deepest work. It is a container that looks inside and empowers the cleansing and empowerment of what you hold within you, so you can create the external environment that you are deeply desiring. Each month, we gather in a small and intimate space of sacred sisterhood, to journey, to be authentic, to be empowered and raised up into where we are reaching. Bi-Weekly Calls as a group recorded on zoom. A theme of wisdom to be guided and prompted through each month accompanied by horse medicine. An in-depth welcome packet to pave the space for us knowing what you are working with and what is being called forward in you. This container is about navigating through all the realms we create through, spiritually, mentally, emotionally and physically. You will be taught and learn how to recognize your patterns, empowered through shifting the way of being that is not empowering what you are calling forward. And encouraged and held in the visions that are speaking to you to step into. It is a blend of group empowerment with 1:1 support so you are held and given the accountability and mentorship that will give you the greatest support you are needing in the now. A deep solidness in who you are and what you are creating. An internal empowerment away from your fears and insecurities. Clarity and vision of what you are moved to step into through your purpose and leadership and how to manifest it. Each time we create a container, we are mindful of holding a space that is impactful and will give outcomes that serve you both internally and externally. 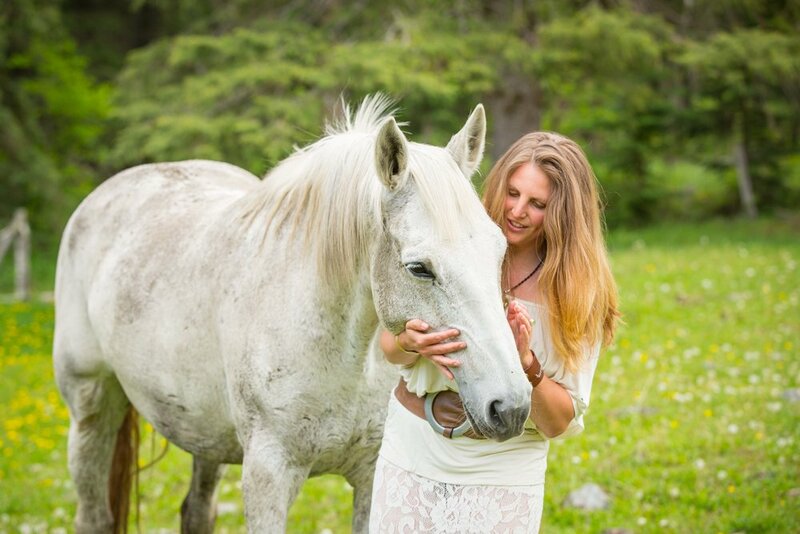 The investment of this program includes monthly group calls, monthly 1:1 support, wisdom from the herd, a piece of jewelry from our horses to anchor your energy through our container, bonus access to content and courses to empower your time in this space. or $2500 CDN paid in full. Our journey begins Monday, October 8th with the New Moon. Due to the intimate and in depth nature of this container, SPACE IS LIMITED. Working with Hillary has widened my perception of what is possible for me. Working with Hillary accelerated my progress tremendously and I can’t thank her enough for holding that space for me. In the 90 days that we worked together, I went from having an abstract picture of my possibilities…. ....to a woman who knew she had something to share with the world. ....to a woman who declared the medicine I have within. ....to a woman taking action to share my medicine. ....to a woman with an intuitive coaching practice and a thriving crystal jewelry line. Hillary will help you clear the self-doubt so you can move into exploring what it is you are here to do in this world. She will be your biggest advocate, sacred space holder, believer, earth angel, and bringer of clarity. When I started working with Hillary I had just quit my six-figure corporate job and wasn’t sure what to do next. I knew that I couldn’t stay in the corporate world and knew that I wanted to be of service somehow, but wasn’t sure exactly how to do it. Hillary and I worked together and leaned into my core values and desires to determine exactly where to start. With Hillary’s help I was able to deepen into my crystal jewelry business by offering intuitive custom designs. This deepening allowed me to do what I love and infuse it with my medicine. Hillary held the container for me to define the type of coach I wanted to be. I had been trying to step into coaching by being the coach I thought I *should* be rather than the coach I wanted to be. We explored, held my medicine up to the light so that I could hold space for exactly the type of coach that I wanted to be. Now I can proudly say that my medicine is like no other, rather than trying to fit into the box that I tried to keep myself in. I have been working with Hillary for almost 9 months. It’s difficult for me to summarize everything that has transpired since we first began our work together as there is SO MUCH THERE! I have launched a business entitled Venusian Vibrations and am now a Sensuality Guide and Reiki Visioning Practitioner, working with women across the globe! I hosted my first retreating Hawaii last February and am getting ready for my next one this coming Spring 2017! I have gotten in touch with my intuitive abilities, I learned to manage my overflowing and hypersensitive energies and I am now stepping more solidly into my offerings and leadership, all due to the support and encouragement I received from Hillary along my path. Hillary calls it like it is, catches me when I am playing WAY to small and is an AMAZING second brain to have around when life situations come flying through the door and you have no idea what to do with it all!! Hillary offers the greatest amount of support in holding a torch really, bringing the disillusionment out of the shadows and seeing it for the teachings it brings. Not as something scary, but as something to be integrated along the path. We just kicked off with a 2-hour immersion call, but I feel like that’s the best conversation I’ve ever had about my business. I feel like you really understand me, what I do and what I want to build, holistically. I already feel 1000% supported. It’s amazing how you’re able to see the BIG big picture of work/life/personality type/zone of genius, and resistance and address them all through your coaching and with the horses.